One of the most buzzed-about movies of the year coming off of the festival circuit is the independent darling Call Me by Your Name. But does it live up to the hype? Well, in most regards, yes. Yes it does. Set somewhere in Northern Italy during the year of 1983, Call Me by Your Name is about a graduate student named Oliver (Free Fire‘s Armie Hammer) who is assisting a Classics professor named Perlman (Michael Stuhlbarg from The Shape of Water) for the summer. When Oliver meets Perlman’s musically talented seventeen year old son, Elio (Lady Bird‘s Timothée Chalamet), the pair becomes fast friends, exploring the nightlife and scenic sights of the area together. The idyllic setting and lifestyle leads to a romantic relationship between Oliver and Elio, one that, for several different reasons, is doomed from the start. 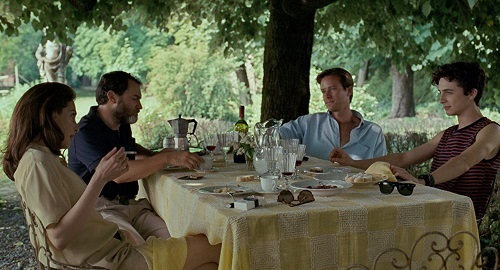 Adapted from the novel by André Aciman by legendary screenwriter James Ivory (although he is a more legendary director, with credits like Howard’s End and The Remains of the Day to his name), Call Me by Your Name is the newest movie from Italian director Luca Guadagnino (A Bigger Splash, I Am Love). It is a beautifully realized coming of age tale, both for Elio and for Oliver, that explores how affairs of the heart can sometimes become social taboos. It’s not the second coming of film like a lot of people are saying, but it is a very well-made movie. Interestingly enough, the age gap between the two guys is downplayed (Oliver is 24, Elio 17), so instead of becoming a story about a man who sexually abuses a teenager, the story is all about the blossoming – and star-crossed – relationship between two young men. And that’s a good move, especially in today’s social climate. There’s even a scene where Oliver flat-out asks Elio “can I kiss you?”, just so the consent is not just implied, but verbally stated. And it doesn’t kill the moment at all. It actually helps make it more romantic. For those who liked Guadagnino’s A Bigger Splash, Call Me by Your Name is more of the same. It’s full of beautiful locations captured by stunning cinematography, and features some wonderful performances by Timothée Chalamet, Michael Stuhlbarg, and Armie Hammer. For those who didn’t like A Bigger Splash, there’s more of that, too. It’s also indulgently long winded and glacially paced (all under the guise of it being a “slow-burn tension building” technique). If you can get past those dragging sections, though, Call Me by Your Name is a stirring film, and one that people will be talking about for years. Call Me by Your Name is anchored by an absolutely brilliant performance by Timothée Chalamet. Chalamet is effortlessly able to portray the feelings and emotions of a boy on the cusp of manhood who is experimenting with his sensuality for the first time. Chalamet communicates sexual tension in a way that is both natural and organic, but most importantly, he is able to dial it back when he has love scenes with any of his girlfriends. There are little things that Chalamet does to make it seem as if he’s faking it with the girls, things that he doesn’t do in his scenes with Oliver, showing that he is more comfortable with his older male companion than he is with girls his own age. Michael Stuhlbarg and Armie Hammer also get their moments in the sun. Stuhlbarg in particular has a great speech towards the end of the film. Yet, even Stuhlbarg’s Oscar monologue is overshadowed a scene later as the camera fixates on Chalamet’s face during the closing credits for an impossibly long take in which the young actor runs through the entire spectrum of emotions that the audience has just been put through while watching the movie. Seriously, learn to say (and spell) the name Timothée Chalamet, because this kid is going places. Timothée Chalamet is also given a chance to show off his musical talents in Call Me by Your Name. The character of Elio is a musical prodigy, and Chalamet plays both the piano and the guitar in the film. One memorable scene has Oliver asking Elio to repeatedly play a Bach piano piece, and Elio changes it ever-so-slightly each time to show what other composers would have done with the melody. Chalamet is at the piano, and if it’s not him playing, then this paragraph belongs in the acting category. If it is, he understands the subtleties and nuances of classical music on a deep level. Of course, since it’s set in 1983, there is the requisite eighties pop song placement – in Call Me by Your Name, it’s The Psychedelic Furs’ “Love My Way.” There are also a couple of original songs by folk popster Sufjan Stevens, just to get the film into the Best Original Song running for the Oscars. Between the classical, the retro, and the modern, the music in Call Me by Your Name is full of hit songs that still help move the story along.